Bank of Baroda has launched the new version of it’s mobile banking app “Baroda M connect Plus”. There are so many new features in the new app. You must read this. 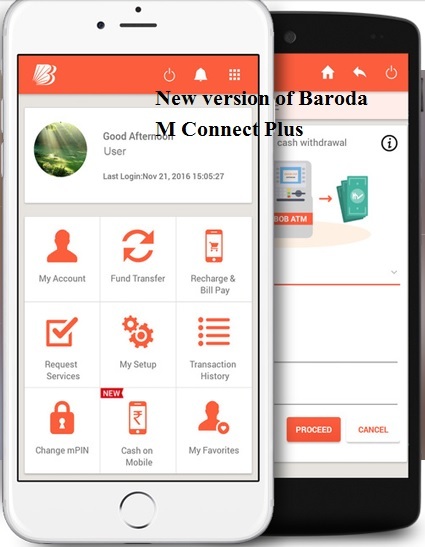 Bank of Baroda Mobile banking Baroda M Connect plus new version. NRE Customers special in Baroda M conncet plus. Now NRE customer also can use BOB Mobile banking Baroda M connect Plus. Earlier it was not possible. Yes, now you can close FD through mobile banking also. Earlier you could open FD online but closure was not possible. Now you can transfer you saving account to any BOB branch online through Baroda M connect Plus easily. Just place request through mobile banking App. You cab renew your FD. You can pay EMI of your loan also. Cash on mobile also is very good feature of BOB Mobile banking app. Using the last 6 digits of your debit card you can reset MPIN.